Prior to the sixteenth century when Caterina de’ Medici introduced the French royal court to garlic bread soup it was considered peasant food. It is often compared to the Italian version of French Onion soup and I am rather surprised that it isn’t found on more Italian menus along side Minestrone for it is simply delicious. This soup is hearty, relatively simple and looks fancier than it really is. 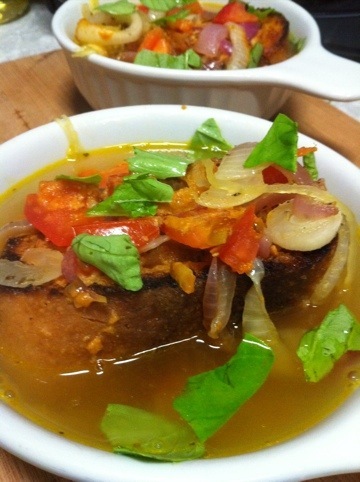 Traditionally the soup is made with tomatoes, onions, garlic bread and chicken broth. I modified it by adding spaghetti squash, garlic cheesy bread and vegan broth. Only half of the spaghetti squash was needed so it is a perfect soup to make if you have leftovers. You many use any tomatoes that you have and if you have cherry or mini tomatoes you could throw those in without cutting. We had an abundance of Roma’s so I used those but I think heirlooms would have made it visually stunning. Make spaghetti squash and garlic bread first. In a large skillet saute onion and oregano in olive oil over medium heat until onions are translucent, about 15 minutes. While onions are cooking start broth. Is a pot add Better Than Bouillon and pepper to water. Bring to boil and then remove from heat. After onions are translucent add garlic and saute for 5 more minutes. Remove from heat. Lightly oil a 13″ x 8″ casserole dish. Cover bottom of dish with spaghetti squash. Arrange garlic cheesy bread over the top of the squash, cheesy side up. Spread onions over the top. The next layer is the tomatoes. Use three cups of the broth and pour it over the casserole. Let sit 5 minutes so it absorbs into bread. Pour in three more cups of broth one cup at a time reserving 4 cups for later. Use reserved cheesy spread and spread with the back of a spoon over the top of the tomatoes. Cover casserole with tin foil and bake for 45 minute. Remove foil and up heat to 400 degrees. Cook for 15 minutes (this includes the time before the oven has reached 400.) While the casserole is cooking last 15 minutes reheat remaining broth. 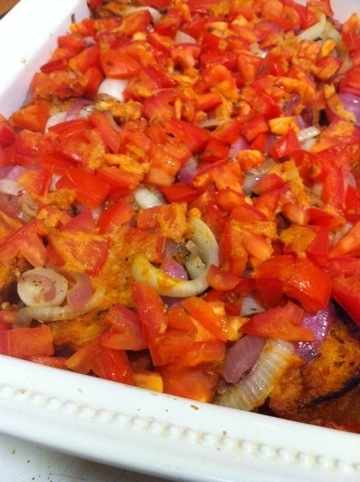 To serve, put casserole with one slice of the bread per bowl. Put 1/2 cup of broth per bowl around casserole. Tear two basil leaves per bowl over the top and serve.